Science Policy Unit I am particularly concerned with burnout of medical workers and sustainability of Japan’s medical welfare system. I use Antonovsky’s Sense of Coherence Scale to evaluate likelihood of burnout and tendencies to violence before they surface. I propose advance directives to reduce burden and misunderstanding of medical staff. Institute for Liberal Arts and Sciences (ILAS) Current socio-cultural psychology research projects: 1) creation of materials for a website featuring Japanese indigenous psychological concepts, 2) cross-cultural studies of values and acceptance, and 3) mutual self-enhancement and support. In language education, cross-cultural classroom research involves Online Intercultural Exchanges with university students in Japan, China, Germany, and Indonesia. Institute for Integrated Radiation and Nuclear Science Our study is focused on the various post-translational modifications of proteins in lens, brain and skin which include processes such as: deamidation, racemization, stereoinversion, isomerization, truncation, phosphorylation, oxidation and the increased intramolecular disulfide bonding of inert proteins. While these post-translational modifications are spontaneously generated during the aging process, their probability of occurrence are also increased by UV (ultraviolet) and gamma ray irradiation. Institute of Grief Care, Sophia University I have studied the soul of language, sacred sites, the history of spirituality, the synthesis of Buddhism and Shinto, and problems of old folks and children. Language, land, and humans, myth. Institute of Economic Research My professional interests are Comparative Economics, Transition Economics, East European and Russian Economic Systems. In particular, I do empirical research on policy issues during transition to the market economy, structure of institutions and enterprises and corporate governance in Russia and Eastern Europe. Kokoro Research Center My research field is clinical psychology; I am interested in the cultural and historical background of psychotherapy, beyond the various psychological problems appearing in psychotherapy. In this sense, my concern is how consciousness today is reflected in psychotherapy. While the psychotherapy inaugurated by Freud takes neuroses as its object, and is based on self-consciousness, the consciousness of today seems to have a different structure, appearing in new symptoms like dissociation, developmental disorders, and psychosomatic disorders. As a Jungian analyst, I work with images, but recently I am more interested in the dialectics of psychotherapy. As methodology, I use not only case studies in psychotherapy, but also investigation and studies of literature. I am looking for a methodology transcending the use of narratives alone. Graduate School of Human and Environmental Studies Multidisciplinary approach of Spatial Perception and Cognition from Pripheral Inputs to Higher Order of the Brain. Institute for Frontier Life and Medical Sciences Endogenous retroviruses (ERVs) occupy about 10% in the mammalian genomes. Most ERVs are inactivated by mutations and deletions and considered to be “junk DNA”. Some ERVs retain open reading frames and are translated into functional proteins. I am currently studying ERVs and animal retroviruses. Yukawa Institute for Theoretical Physics What is life? This long standing problem has attracted many physicists especially since Erwin Schrodinger published the famous book in 1944. Nevertheless, this problem has not been solved yet. Indeed, we have been too much familiar with the traditional reductionists’ view that requires identifying the elements at different levels of biological organization and understanding the relations between the different levels. On the basis of this traditional reductionism, however, we cannot understand how living things are different from nonliving things, because we cannot understand how living things different from nonliving things, because both are equally made of material molecules. To understand life itself, we must identity not only the elements but also the elementary processes within the organism. Only then, normal states and disease states and even senescent states can be clearly understood in terms of dynamic changes in the elementary processes as well as plastic changes in the elements. Along this line, I am constructing a theory of life. Center for Ecological Research I am a Professor of the Center for Ecological Research, Kyoto University, and a microbial ecologist in freshwater and marine environments. In 1994, I started my research career as a researcher at the Lake Biwa Research Institute, the Prefectural institute for conservation of Lake Biwa, the largest lake in Japan. I conducted several research projects on bloom forming mechanisms of cyanobacteria (Microcystis) in the lake. In 1996, I moved to the Faculty of Agriculture, Ehime University, and focused my research to protistan (protozoan) ecology in freshwater environments, especially in eutrophic lakes. After the establishment of Center for Marine Environmental Studies (CMES), Ehime University in 1999, I moved to CMES and conducted researches on planktonic food web dynamics in a nearby coastal marine system where pearl oyster culture was actively performed. In 2003, I came back to Faculty of Agriculture in the university and conducted researches on food web dynamics in lotic and lentic environments of freshwater and marine systems. In 2008, I moved to the Center for Ecological Research (CER), Kyoto University and have so far been conducting researches on food web dynamics, with special reference to bacterial, algal and protozoan ecology, in lakes, especially Lake Biwa, the largest lake in Japan. I also have been conducting researches on protistan ecology in Lake Suigetsu, a meromictic lake with a permanent oxycline separating the aerobic freshwater epilimnion from the anaerobic, saline, sulfidogenic hypolimnion. Graduate School of Education My research interests have focused upon studies of Human personality, Life cycle, and Spirituality. My recent interest are in the Japanese traditional wisdom of human transformation. Mie Prefectural Museum(MieMu) Functional morphology of brachiopods;Actuopaleontological approach on growth line formation rhythms of molluscan shell; Origin of metazoa in referrence to Ediacaran fossil biota; Development of learning programms for people of different ages (from children to seniors) basing on science methodology (observation, making guess, debate and verification) in order to stimulate peopleis interest to investigate their environment. Institute for Research in Humanities Musical Romanticism and Melodramatic Music in the 19th century. Gakushuin University My current interests are mathematical fluid mechanics, numerical methods for fluid computations, and numerical computation of bifurcation and stability. Research Institute for Mathematical Sciences I’m interested in algorithms on numerical computation. My main interest is numerical integration, and I have proposed a new double exponential formula to compute the Fourier type integrals. Recently, I also have proposed a continuous Euler transformation which accelerates the convergence of the integrals with slowly decaying integrand. Kavli Institute for the Physics and Mathmatics of the Universe My field of research is theoretical physics, mainly in the areas of general relativity and cosmology and I focused on the origin and evolution of the universe. Kwasan and Hida Observatories My main research subject is to study explosions and activities of cosmic objects, especially magnetohydrodynamic explosions, jets, and active phenomena in our universe. Research method is theory and computer simulations, but includes also observational data analysis, such as the analysis of data taken with Hinode and also Hida Observatory. Recently, our research field expands to space weather prediction study, and also to astrobiology and space survivability. Center for Ecological Research I study insect-plant interactions and plant-plant interactions mediated by plant volatiles using chemical ecological methods. Institute for Integrated Radiation and Nuclear Science 1.Mechanisms of spontaneous racemization and isomerization of amino acids in proteins during aging. 2.The post-translational modifications such as deamidation, racemization, stereoinversion, isomerization, truncation, oxidation in proteins and age-related diseases. 3. The mechanisms of proteins folding and protein misfolding with aging. Kokoro Reserch Center My research has focused on cultural variations in emotion and social relationships. In the course of my research in cultural psychology, I have suggested that daily practices and meanings construct our psychological functions and self-systems. In particular, my research examines the meanings of happiness and unhappiness; people’s experience of emotions and understanding of others’; and the roles of emotional support and social relationships. My cross-cultural studies examine how participation in meaningful cultural practices fosters these psychological processes. Research Institute for Mathematical Sciences I’m working on Fluid Dynamics and its related applied mathematical methods. I’m particularly interested in those problems related to turbulence theory, geophysical fluid dynamic, motion of small creatures in fluids and application of wavelet analysis. Recently I have been studying relations between statistical properties of turbulence and structure of solution orbits in phase space. Also I study flow pattern formations of Navier-Stokes fluid on a rotationg sphere, where global patterns emerge from initial turbulent fields through wave-mean flow interactions. Data analysis method is another topic I’m interested in. Statistical methods with wavelets for data analysis are one of my research subjects. 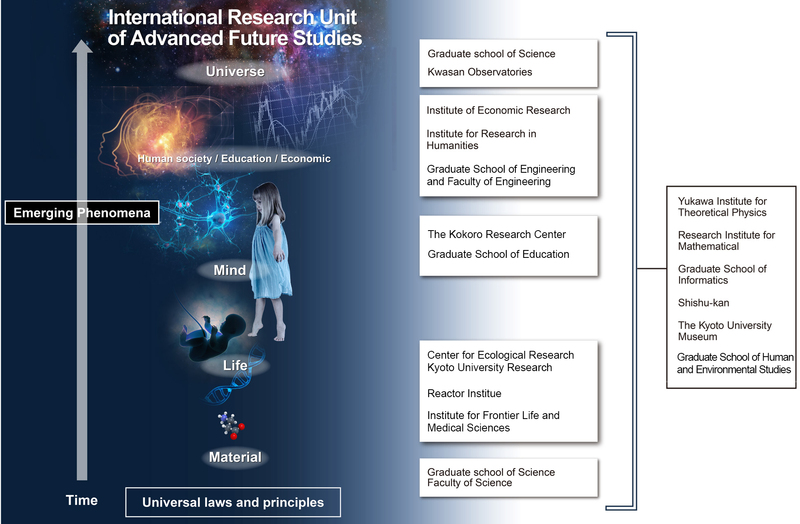 Shishu-kan, Graduate School of Advanced Integrated Studies in Human Survivability (GSAIS) Over the last decade, the decline of science-based industry in Japan has been accelerating. Why has such decline occurred? We have proved that the decline in the bio-science industry is due to the apparent failures of the innovation policies in Japan, especially the SBIR (Small Business Innovation Research) policy. In order to reform the innovation policy of Japan, we study newer, more efficient and effective models. We also focus on the creation of a new vision for the design of graduate school systems that will generate ‘innovation sommeliers’ who are capable of effectively connecting science and innovation. Graduate School of Science Science and technology have been flourishing far more than we imagined in last several decades . Without development of new materials as well as research on material chemistry, modern science and technology wouldn’t have advanced this much. From a chemical perspective, the Yoshimura Lab’s research focuses on inorganic compounds including metal elements primarily for exploration and development of new materials that demonstrate new quantum phenomena such as high-temperature super-conductivity. In particular, systems with strong electron correlations, which are expected to lead the materials of the 21st century, are the subjects of interest.